We have developed a novel method for mapping air-pollution with path-integrated optical remote sensing (ORS) systems. We have conducted two preliminary studies, where tank farm emissions in the 200 east area were monitored using Open Path Fourier Transform Infra-Red (OP-FTIR) spectroscopy. 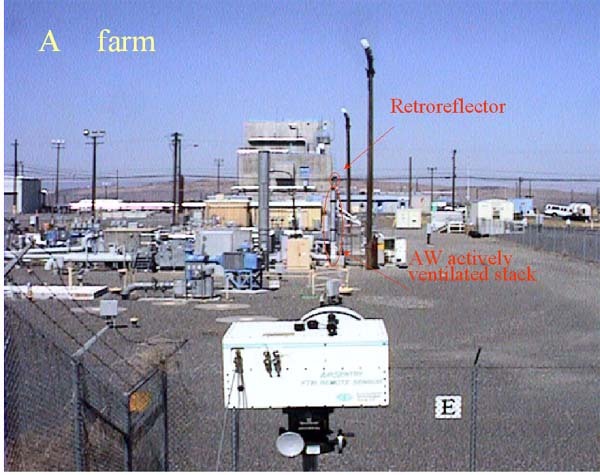 In the first monitoring campaign, the AW farm primary tank ventilation stack and the C farm stacks were observed. These measurements provided base line concentration and emission data when no waste transfer or removal activities were taking place. Ammonia and Nitrous Oxide were detected. Ammonia concentrations were low from the human exposure perspective, except for the immediate area of tank C-103 where concentrations could have exceeded the TLV-STEL. The second monitoring event occured during a sluicing process test in the tank C-106. This test aimed to drive up hydrocarbon emissions to high levels (up to 400 ppm) which were detected in the stack during sluicing with an organic vapor analyzer (OVA). During the 8 hour test process, our OP-FTIR real time total hydrocarbon measurement through the stack outlet correlated very well with the OVA data. Further, Nitrous Oxide concentrations were highly correlated to the total hydrocarbon concentrations (Pearson correlation 0.97) over the same time period. This suggests that Nitrous Oxide might be a suitable tracer gas for mapping the hydrocarbons and assess worker's exposure to hydrocarbons in the vicinity of the tank farm. OP-FTIR has the capability of identifying and detecting a wide range of gases, but it is limited in range and sampling time. When measurements are desired only for one or two gases (like Nitrous-Oxide), a simpler and more cost effective ORS system like a Tunable Diode Laser (TDL) could be devised. A TDL system when coupled with our novel mapping techniques could provide real time maps of the gas distribution over the entire 200 East or West areas. Open-Path Fourier Transform Infra-Red (OP-FTIR) spectroscopy is a well accepted optical remote sensing (ORS) technology for measuring gaseous air contaminants. It shines an infrared light along an open beam path up to 1 km long and detects changes in the intensity as a function of wavelength. As most other ORS techniques, it provides path integrated concentration data and can not spatially resolve the field of concentration. We have developed a method to overcome the spatial resolution problem. The key to our method is a rather simple and sparse ORS ray geometry, that allows computer mapping of pollutant distribution of concentrations. We have conducted a validation experiment utilizing the suggested beam geometry and releasing N2O in our ventilation chamber (Wu et al., 1999). We verified the test map concentration with 13 point samplers. Our computer mapping approach used superposition of two bi-variate assumed functions in order to reconstruct the field of concentration in the plane. Reconstructions in both simulation and experimental studies showed promising results. 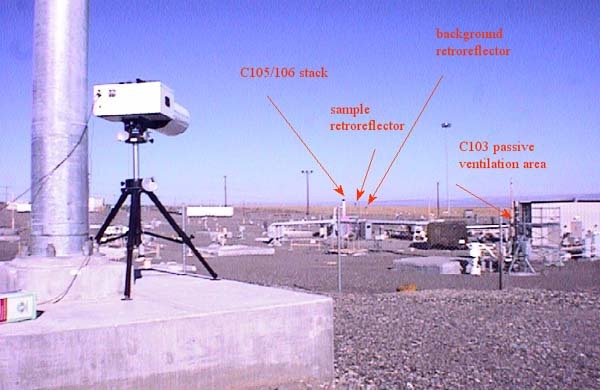 On September 2nd and 3rd 1998, we conducted the first monitoring campaign at the Hanford tank farms using our Open Path Fourier Transform Infra-Red (OP-FTIR). Two tank farms in the 200 east area were identified: AW joint actively ventilated stack and C farm (actively ventilated stack C105/106 and the area of the passively ventilated C103 tank). Ammonia and Nitrous Oxide were detected in both monitored tank farms. The time series of Ammonia concentrations over the AW farm stack are plotted over an hour between 4 to 5 PM, September 2nd. Absorbance spectrum of Ammonia as acquired at the area of C-103 tank, along with reference absorbance spectrum of Ammonia. Generally, Ammonia was low from the human exposure perspective, except for the area of C-103 tank where concentration could have reached the TLV-STEL, if assuming a very narrow plume. On Sunday March 7th we have conducted the second monitoring campaign. This monitoring event occurred during a sluicing process test in the tank C-106. This test aimed to drive up hydrocarbon emissions to high levels (up to 400 ppm) which were detected in the stack during sluicing with an organic vapor analyzer (OVA). 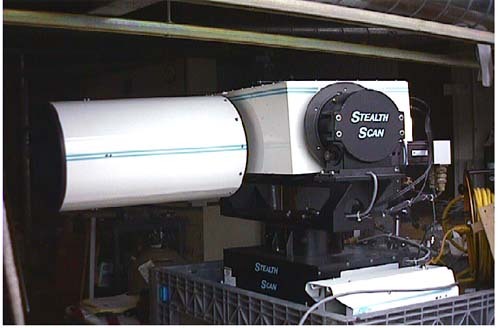 The OP-FTIR 356 m beam-path was set-up to go through the C-106 stack outlet. Spectral data were acquired and averaged over 2 minute time intervals. The instrument operated continuously for almost 9 hours (11:30 am - 8:30pm) and collected more that 220 spectra. During the 7 hour test process (1:24 pm - 8:20 pm), our OP-FTIR real time total hydrocarbon measurement through the stack outlet (quantified as Heptane) correlated very well with the OVA data (averaged over 5 minute interval). Further, Nitrous Oxide concentrations were highly correlated to the total hydrocarbon concentrations (Pearson correlation 0.97) as measured over the same time period with OP-FTIR. This suggests that Nitrous Oxide might be a suitable tracer gas for mapping the hydrocarbons and assess worker's exposure to hydrocarbons in the vicinity of the tank farm. The first OP-FTIR monitoring campaign provides base line concentration data when no transfer activities were taking place. We conducted the second monitoring campaign during a sluicing process test in the tank C-106. We showed the feasibility of real time multiple gases monitoring in the tank farms’ stacks using an OP-FTIR. Unlike Ammonia Nitrous -Oxide concentrations corresponded very well to the total Hydrocarbons concentrations. OP-FTIR has the capability of identifying and detecting a wide range of gases, but it is limited in range and sampling time. When one or two gases are desired for detection (like Nitrous-Oxide) one could apply a much more cost effective ORS system like a Tunable Diode Laser. These systems have a longer range (> 2 km), and when coupled with our novel method could provide real time maps of the gas distribution over the 200 east area. This research was supported by the Consortium for Risk Evaluation with Stakeholder Participation (CRESP) through US Department of Energy (DOE) Cooperative Agreement #DE-FC01-95EW55084. This does not constitute an endorsement by DOE of the views expressed in this poster. R.A. Hashmonay, M.G. Yost, Y. Mamane and Y. Benayahu, “Emission Rate Apportionment from Fugitive Sources Using Open-Path FTIR and Mathematical Inversion”, Atmospheric Environment, 33(5), 735-743 (1999). R.A. Hashmonay, M.G. Yost and Chang-Fu Wu, “Computed Tomography of Air Pollutants Using Radial Scanning Path-Integrated Optical Remote Sensing”, Atmospheric Environment, 33(2), 267-274 (1999). R.A. Hashmonay and M.G. 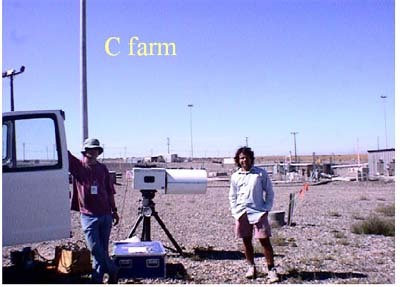 Yost: “Innovative Approach for Estimating Gaseous Fugitive Fluxes Using Computed Tomography and Remote Optical Sensing Techniques”, Accepted in Journal of A&WMA, July 1998. Yost M.G., Hashmonay R.A., Zhou Y., Spear R. Park D.Y., and Levine S., “Estimating Maximum Concentrations for Open Path Monitoring Along a Fixed Beam Path”, A&WMA, 49, 174-185, March 1999. R.A. Hashmonay and M.G. Yost: “Localizing Gaseous Fugitive Emission Sources by Combining Real Time Optical Remote Sensing and Wind Data”, Accepted for publication in A&WMA, December 1998. R.A. Hashmonay and M.G. Yost: “On the Application of OP-FTIR Spectroscopy to Measure Aerosols: Observations of Water Droplets”, in press Environmental Science & Technology, will be published in April 1999. R.A. Hashmonay and M.G. Yost., “Gaseous Emission Estimation from Fugitive Sources Using Optical Remote Sensing and Computed Tomography Techniques”, In proceedings of 1998 Pacific Basin Conference on Hazardous Waste, Honolulu, Hawaii, April 1998, 414-425. Lee A. Newman, Xiaoping Wang, Remi Cortellucci, Robert S. Crampton, Stuart Strand, David Domroes, James Duffy, Gordon Ekuan, George Karscig, Indulis A. Muiznieks, Tim Newman, Ram A. Hashmonay, Martin Ruszaj, Paul Heilman, Michael G. Yost, and Milton P. Gordon, “Remediation of Trichloroethylene in an Artificial Aquifer with Trees: A Controlled Field Study”, Submitted and revised to Environmental Science & Technology in Oct. 1998. Wu, C.F., Yost M.G., Hashmonay, R.A., Park D.Y., “Experimental Evaluation of a Radial Beam Geometry for Mapping Air Pollutants Using Optical Remote Sensing and Computed Tomography”, Accepted for publication in Atmospheric Environment.